The Cycle to Syracuse group includes the head teacher at Lockerbie Academy, a local police officer, firefighter, ambulance officer and a mountain rescue volunteer. They've tackled the trip in three stages - starting with a tour of local schools in Dumfries and Galloway, followed by a mass participation cycle from Lockerbie to Edinburgh and then finally by riding from Washington DC to Syracuse University in New York state. They're due to reach Syracuse on 1 November. Thirty-five students from the university were among the 270 people to lose their lives in the disaster when Pan Am flight 103 on its way from London to New York exploded above Lockerbie on the evening of 21 December 1988. All 259 passengers and crew on-board and 11 people on the ground were killed. Since the disaster strong links have been forged between Lockerbie and Syracuse. 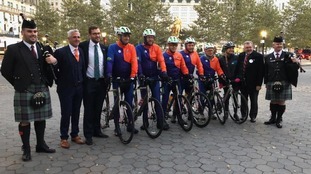 Scottish Secretary and Dumfriesshire MP David Mundell was in New York to see the cyclists off on the final leg of their adventure. "This is a really important way of marking the 30th anniversary of the Lockerbie bombing. "It is about respecting and remembering those people who died that night, but also looking forward to strengthening and deepening the relationship that's grown up between Lockerbie and Syracuse. "It has been very moving for me personally to see off the Cycle to Syracuse cyclists from New York City on the final leg of their journey to Syracuse University." The journey from Lockerbie Academy to Syracuse University in New York state covers 3,238 miles, with the distance cycled totalling around 672 miles. As well as remembering the 270 people who died the cycle ride is also raising money for Dumfries-based youth mental health charity, Soul Soup.